Disney World is introducing a new first of its kind Audio Description Technology in its Theme Parks to aid guests with visual disabilities. This Disney patented handheld technology will be made available at no cost for its guests to allow them to receive detailed audio descriptions of the Disney World theme parks as they tour them. 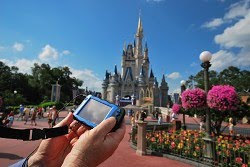 LAKE BUENA VISTA, Fla., June 22, 2010 – National Society of Professional Engineers Names Handheld Assistive Technology Device “New Product of the Year"
Beginning June 27, guests with visual disabilities will be able to explore Walt Disney World theme parks in a whole new way through an enhanced Disney-designed device that provides detailed audio description of outdoor areas and fits in the palm of a guest's hand. ■Activation of closed captioning in pre-show areas where television displays narrate the upcoming experience. WGBH teamed up with Disney to deliver outdoor audio description, marking the latest collaboration between the two organizations, which began with the installation of WGBH's Rear Window® Captioning system in Disney's theater-based attractions in1996. Disney has patented and licensed the assistive technology, which could serve a wide variety of retail, commercial and industrial applications. The technology is already being used at the World of Coca Cola Museum, The Hall at Patriot Place and the Dallas Cowboys Stadium and will receive the National Society of Professional Engineers 2010 “New Product Award” next month. “We are particularly excited to make this technology available beyond Disney Parks and extend accessibility where it was previously impractical,” added Hale. Softeq Development Corporation is licensed to make the technology available beyond Disney Parks. ■Resort Access – Resort hotels at Walt Disney World Resort offer special equipment and facilities for guests with disabilities such as phone text, visual indicator door knocks, sloped-entry pools and aquatic chairs. The Handheld Assistive Device is offered at no cost with a refundable deposit at Walt Disney World Resort and Disneyland Resort theme parks. Audio description of outdoor areas will be available at Disneyland Resort next year. For further information about services for guests with disabilities, guests should visit the Walt Disney World Web site at http://www.disneyworld.com/ or contact Walt Disney World Information at 407-824-4321 (voice) or 407-827-5141 (TTY). 0 comments to "Disney World Launches New Outdoor Audio Description Technology for Guests with Disabilities"